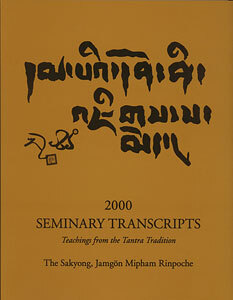 Available to students who have completed Vajrayana Seminary or Sacred World Assembly and who have received the Vajrasattva empowerment from the Sakyong or read the permission blessing, which is the first talk in the 1999 Seminary Transcripts, Teachings from the Tantra Tradition, "Permission Blessing and Vajrasattva Empowerment Tri." In addition, students studying this material are expected to receive the abhisheka directly from the Sakyong at the earliest possible date. Teachings from the Tantra Tradition. 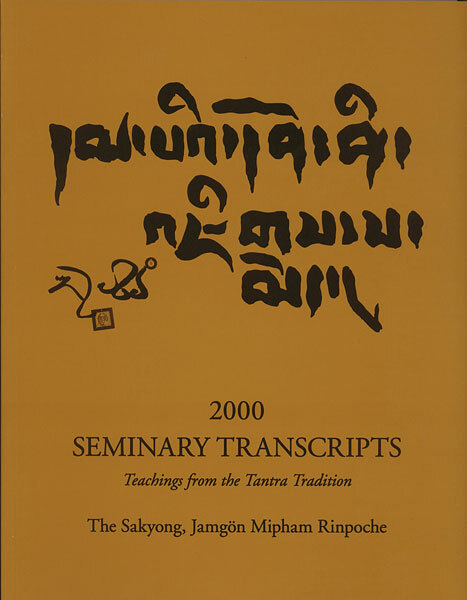 This is an edited transcript of the vajrayana talks given by Sakyong Mipham Rinpoche at the twentieth Vajradhatu Seminary, held at Rocky Mountain Shambhala Center (now SMC), Red Feather Lakes, Colorado, summer 2000. The talks are based on the Guhyagarbha Tantra and the commentary written by Jamgon Mipham Rinpoche (1846-1912).